Coronado has developed a series of telescopes as a result of the often asked question, “What is the best telescope to use with a Coronado filter?” While almost all refractors and most reflecting telescopes can be used with a Coronado filter, no other telescope has been designed with all its optical aberrations and coatings optimised at H-Alpha. Most nighttime telscopes, when used at H-alpha, will not have the image contrast exhibited by a SolarMax series telescope nor the image quality. Most broadband coatings, used on such telescopes, will have reduced effectiveness at this wavelength and telescopes (particularly reflectors) not specifically designed for Solar viewing, will exhibit unnecesary scattering and spurious light transmission. All of the Coronado SolarMax telescopes, even the PST, have been designed with this one wavelength of light in mind and will increase contrast and give you a darker background for viewing and imaging. The Sun in H-A is the most dynamic object you will ever see while pointing a telescope skywards. Constantly changing and never repeating itself the Sun through a Coronado SolarMax telescope will hold your attention for a lifetime. Our telescopes serve to enhance that view for you, your family, and friends. The telescopes provide an easy and portable set up that is always ready right out of the box. The two different series of telescopes are the Personal Solar Telescope, or PST, and the SolarMax series of which there are 4 apertures and varying bandpasses. Please read on below to learn about each one of these unique telescopes. Once you have found the product you want click on 'In Stock' from the main drop down menu in the upper right hand side. Sub angstrom H-A systems have long been cost prohibitive for the amateur. Designs other than the Coronado are difficult to use because of temperature and F-Ratio requirements. Not only does the PST have a bandpass of <1.0 angstrom but it is also thermally stable and requires no more time to operate than putting in a eyepiece and adjusting the focus. 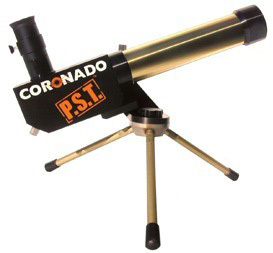 The PST represents the same technology and quality that goes into a SolarMax series telescope but with a few unique design characteristics that allow us to offer it for less than some premium eyepieces. The PST will show you prominences, active regions, filaments, as well as other surface details – at <1.0 angstrom it will not reveal as much surface detail as the SolarMax series telescope and filters but it certainly doesn’t disappoint. “To be honest I was not expecting too much, bearing in mind the cost and diminutive nature of the ‘scope, I finally set up in the late afternoon. Alignment of the ‘scope is a breeze using the inbuilt sun finder, as I looked through the eyepiece I could see a red sun with a small sunspot but no prominences or H-A detail and then decided to try the ‘tuner’, as I rotated the ring the view changed, prominences popped into view! With a little further “tweaking” filaments, faculae, and “orange peel” surface came into view in incredible detail! Absolutely brilliant…” – Mr. N. Longshaw, U.K. The PST is made from milled aluminium, not plastic!. The P.S.T. comes with a built in Sol Ranger for easy alignment, a 12mm Kellner eyepiece, and a re-usable box with dye cut foam for safe storage.